Hey Carrara'ns , some of you may know about the "Carrara Community Movie Project" which aims to showcase Carrara Studio's strength as a 3d program. We are starting with a short "dry run clip" to iron out the bugs and we are looking for volunteers . If you're interested in helping, this is a great way to learn and improve your 3d skills, I find projects like this can really push your skills forward, it can be hard work but very rewarding..
Soooo......, here is a quick StoreyBoard for the "dry run" movie clip . 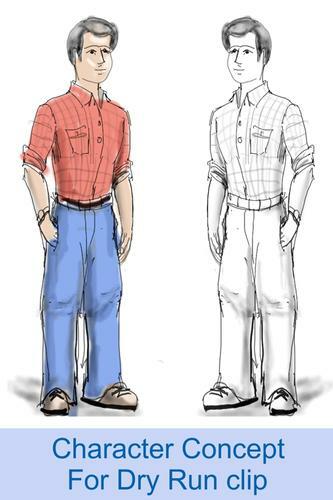 For now we are looking for concept sketches of the Character mainly and the background is secondary. You can do your sketches in any style you wish , cartoony , semi realistic ., whatever you want . We just need to get some ideas going. Check out the link here or see attached image for the "Easy Come Easy Go" storeyboard . There are a lot of useful things we hope to get out of working on a short clip before the movie project. One is just working together as a group ie. File sharing logistics. Another is talent pool recognition. Another is Mentoring / teaching / learning to build up some skills. There is also the hope of getting more people involved. If for instance in the above storyboard --you wanted to try and model the coin.......well......that's something you can share. Maybe its good enough to use. Maybe not- first go round , maybe with some suggestions you make another one a little better. It's this kind of thing that will grow the talent pool upward. As most likely not many folks here have ever attempted to make a community movie project --there are many things to learn , to share and to discover. Brilliant. Thanks for initiating this thread Mmoir! Things are really moving along now! The characters depend on the story, so which one has been chosen? Antara --there is a poll on this forum about which storyline to choose. This exercise I think is more in line to take a short storyline --any kind really and work out the kinks to working in groups , seeing what talent pool there maybe and general learning. Kind of a practice run of sorts. Okay guys, here is my Concept Sketch for the character in the Dry Run clip. I am seeing this guy in cartoony colours... What do you think? I am sure you guys will come up with some great stuff. Here is the link or just look at the attached image. Well, since I was told that the story doesn't matter, I sketched the alien one. So not to be used here, I guess. But I am attaching it anyhow. As a sample. I really like the Aliens idea because it has a potential of being a great animation with lots of emotional points and a universal appeal. 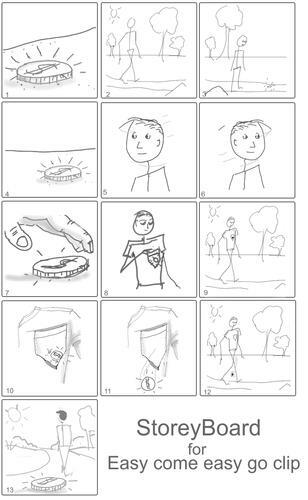 Since there is only one character (and human) in the storyboard above, are we all supposed to sketch this one guy? I like mmoir's character, but I could sketch a couple more if there is need. 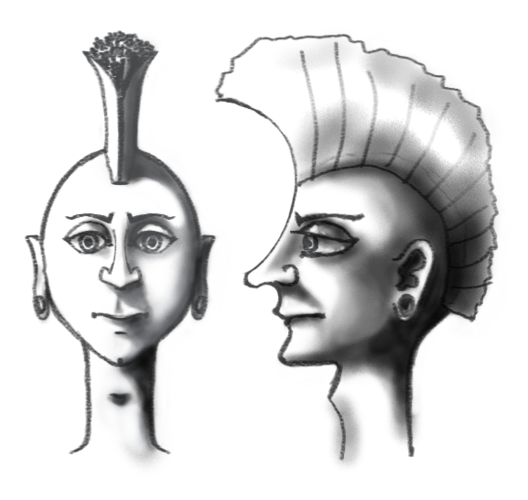 2 very quick character sketches for the lost coin story. 2 very different types of characters. One is the super healthy looking "boy-scout" kid. Yellow t-shirt, beige or khaki shorts white sneakers. The other is vaguely "goth". Lanky and super tall with pale skin. Dressed in all black/gray and reds. If you want me to sketch an idea in more detail, let me know. P.S. Also, with the "goth" character it could be fun to make the hole in the pocket as part of the overall fashion statement with the black jeans t-shirt being fashionably torn and having unfinished edges at the hem and sleeves. Hi, I am new and have collected about a thousand Poser models for fantasy art. To date, beyond learning how to do various tasks, I have been working on fixing data file reference errors and othger such problems. I would like to get involved in a community project and would appreciate any pointers to a place which would appreciate my work. Here's the render I made yesterday, which I built from scratch and made in Carrara 8.1 in a total of 20 hours. Previously such work had taken a month, and I am finally starting to get faster. Since then I fixed the sandals (which didn't fit properly on this model) and I have been getting the libraries into the 8.5 beta. I;m not sure if I thanked you for this dry run ideal and for the dry run follow through. Smart idea Mmoir. I think we need to make sure you are running this project, I like the way your mind works. Thanks a super ton! Great character concept sketches and storeyboard. :coolsmile: Good idea with the goth character too.. I like your characters much more than mine.. what do the rest of you guys think? Both character sets are fantastic. I guess I can agree that Antara's are a fun interpretation of the original concept. I'm all for it. Antara ---really liked your storyboard for alien like movie. And also the "Easy come easy go" one Mike. Already these early steps are helping to figure some things out even without a story yet. It not easy to go from nothing to a Movie Production --so folks have to realize things have to evolve in their own time and maybe not in a straight line. We do have a number of threads kind of all over the place and it might seem a little chaotic but hopefully people understand these early steps are all pretty much focused on learning how to work as a community. So this short clip project as "practice" has all the elements of the larger movie project but it so so much shorter and hopefully one we learn a lot from. Plus - its while we work on the figuring out what story will be used. And in fact --while the final story whatever it ends up as is can be detailed written and story boarded. The modeling thread is also helpful as for one we pick up some assets (props) and the second we have folks learning more about the VM (Vertex Modeler) in Carrara and learning to work together. Emeyer-----there will be lots of opportunities to help in the short clip project and or the full Movie Project. If you can draw, model. texture, animate for instance there will be lots of chances to hook up with some team. If you have render time to share that could be useful. If you have a web site to share awesome.....just think of everything it would take to make a CG movie ---------lots of jobs . Just keep watching the forums here. There is a modeling thread already going and if you want to try some of that--please do. Thank you. Rich. And I look forward to working with you. We are picking a style for the test short, and I would love to hear your opinion about that. The thread is here: Look and Feel Thread. I would also like to talk to you more about process and ways to organize and optimize things. Do you have a preferred method of communication? As for style of the test shot--I have been following that. Its been interesting . Its really a tricky choice as the real jump is going from the drawn storyboard ideas and creating that similar look in Carrara. Its all about lighting , texturing and rendering efforts and the effort as always is worth it but still makes sometimes a challenge. For me , any cartoony looking characters seem more apt to look less like it was done with a 3d package to begin with. . And yet I do like a somewhat realistic look. But sometimes too much realism and you know you get that not so nice 3d look . It's hard edges , sharp shadows and looks well too real or just looks like bad 3d. . So for me I have been trying to wrestle with this myself . Carrara out of the box lends itself to making harsh lit strong shadows scenes and why a lot of new folks images have a similar look and that's not such a good thing. As far as the projects--- I have to say I think Rashad has done a pretty good job organizing duties to start. Have to get things down and start sometimes and work out kinks as you go. As far as communication goes I guess PM would work right now . I have never used it here but seems starightforward. I have more time on weekends than workdays but you know rl always limits the 3d fun . Oh and not to scare anyone off and maybe infact this is too ambitious a movie project to try and emulate in any fashion or way but this making of Sintel is very illuminating in the process of making an amazing 3d short. I liked the style of “Sintel”, too, but this was a funded third generation community project with the full support of developers and the core team assembled in one studio. We at this point don't have that luxury :). Also, even with those advantages, if you watch the short from the technical perspective, you can see that the realism was carefully planned for the resources they had: note the prevalent absence of vegetation, in fact there are only 3 plant types I could count (the bamboo forest, the dragon tree and the spring flower). In fact I think the bamboo forest is the least realistic scene in the whole movie, but it is short enough not to matter. And I think these decisions were made early on to allow for this level of realism. Vegetation is one of the hardest things to pull off in 3D. Especially outside of Vue. Doable, but at heavy expense, and in animation this expense cannot be ignored. They did lots of (cartoonized) vegetation in "Bunny", but every time I see it I shudder at all the fur render times :). I would be scared to go there on a project like this :). This is also something to keep in mind as we select and polish the story to work with. In order for this project to be effective outside the learning benefits to the participants, I think it has to look good to showcase Carrara, and that means we have to make story and shot-by-shot decisions which fit our resources. By the way, that is why in the aliens storyboard I limited the vegetation to the small tree and a segment of a grass field against the sky, and for a wider shot used mountains and water with huge distances implied -- something that Carrara is much better at. And then underwater which has different lighting features and different vegetation looks (fewer branches, no leaves! :-)), so it would be easier to pull off. In the storyboard we are working on here, we have the park. No getting away from vegetation there, so I agree with you that stylized animated look will look better. We just need to get the right balance for it. 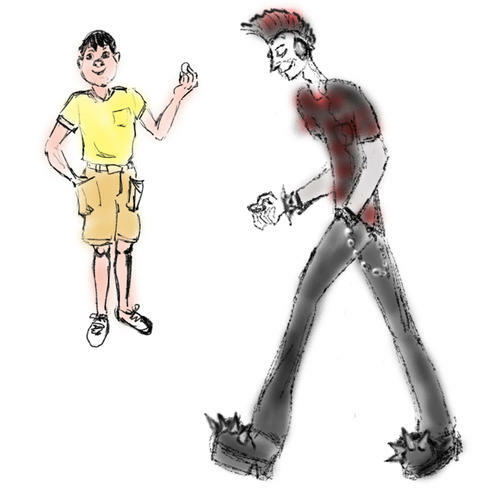 I am posting more sketched for the Teen character here in an attempt to keep the threads consistent and on topic. I am not sure that I am doing this right, though as I never did sketching for models. If there is a better way of doing it,please let me know. I shaded the main reference, but I am including the lines only image as well. The lines are a bit thick, hope it is not a problem. 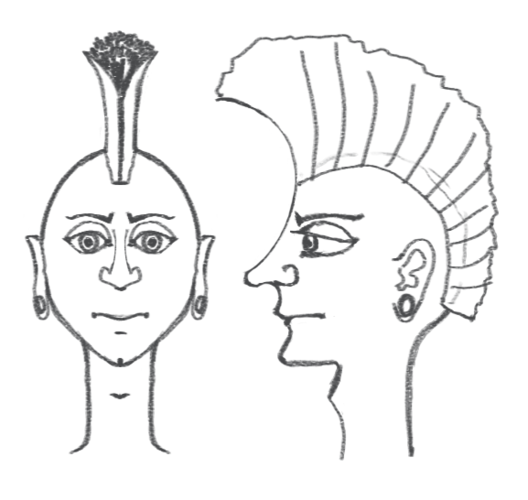 There is also a reference for the expression in the original sketch. Please let me know if there is a different way of doing it or if it can be done better, so I'd know what to do in the future. UPDATE. 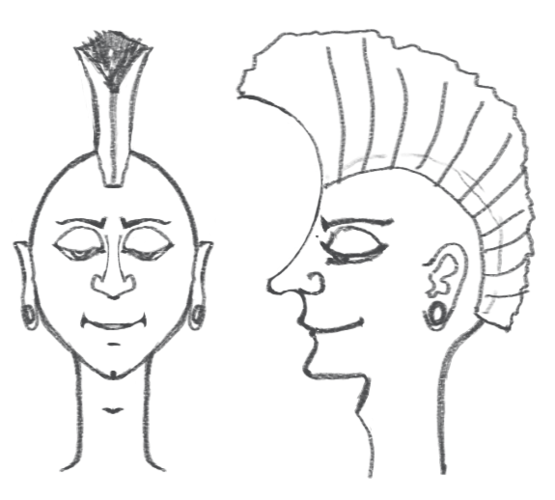 I streamlined the profile a bit for a more stylized look. That looks like it should work fine for modeling , nice job. Yes, I do agree in principle that decisions have to be made when it comes to details of each shot and scene. Some things especially if you want to have GI and Indirect lighting or tons of vegetation do take sooo long. The other side of that of course it usually looks worth the wait. Smiles. I have recently been trying to make some nice vue like clouds in carrara .....and boy its been crazy render intensive. So I certainly understand the issues of render times. But ----you know those kind of things might make the difference. And we have some folks who might have spare cpu time . So i am not so sure in some case we might go all out. Your skecthes look great btw ........I envy your drawing skills. Smiles. 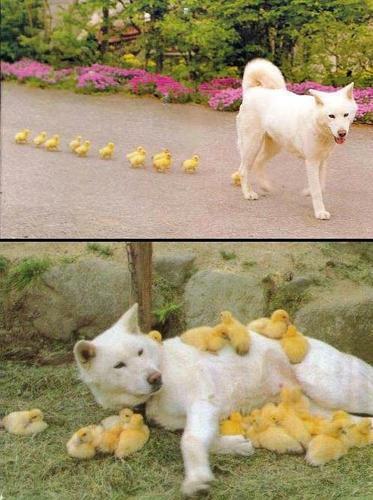 The wolf and the ducks. I suppose one could create an amusing story from these pictures. We already have one duck story . Smiles. But who doesn't like little ducks and the big bad wolf. I think in this thread though --we are more trying to work out a some concepts ideas for a short shot project as a kind of practice run before attempting the much more ambitious movie project. But always keep your ideas flowing as one cannot have enough of these going on. Alright... I get it now. I've seen the storyboard before, but didn't actually follow it through. So... the watch was just a modeling exercise? There's a link for the coin image, but not for the coin.